Ask me about Junior Giants, and I’ll start talking. Non-stop. I’ll slow down if eyes glaze over, but so far, that hasn’t happened. I have stories, facts and figures, and even pictures to add to the conversation. 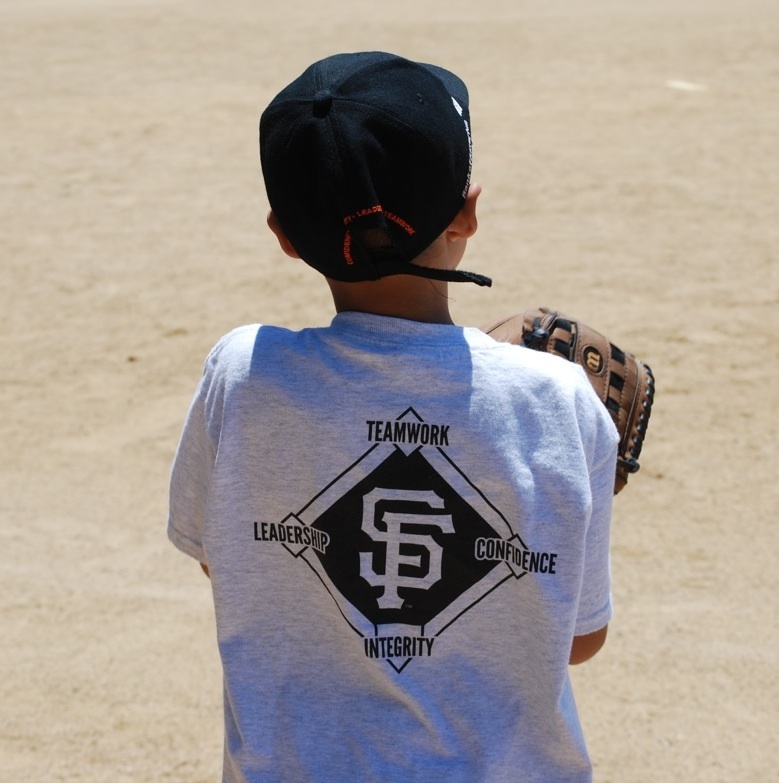 In case you haven’t had “the talk” yet, Junior Giants is a program that develops character with baseball as a framework. It’s free, non-competitive, and focuses on girls and boys who may not otherwise have a chance to play. Some players have challenges that other kids with more advantages in life may not have, and the results can be remarkable. The whole family takes part, too. But first, here’s what motivated me to get involved. I grew up in an era when girls didn’t play organized sports. At least, not fun sports requiring real skills, equipment and cool uniforms. We had to be lady-like. I preferred to climb trees, build forts, and play catch in the yard. Yes, I was a classic Tomboy. Baseball was always my favorite thing to do. With the other girls in the neighborhood, we played in the street with limited equipment we ‘borrowed’ from our brothers. The only coaching I had was playing catch with Dad. He taught me how to hit fungoes, which I did daily after school. I stood on the patio and knocked unripe green apricots over the fence and onto the street. I don’t know how many cars I dinged along the way. I could hit anything in those days. My brother played Little League, but not very well. He had depth perception problems so they put him in right field. He didn’t like it. He was more of a football or dig-holes-in-the-backyard kinda guy. It killed me to watch him from the stands. In fourth grade, the neighborhood girls and I would gather what baseball equipment we could find and ride our bikes a few blocks away to wait for the Cub Scout meeting to end. We knew the boys would play street ball with us. They respected our baseball skills. But still, it was the boys who got to play in organized leagues. Fast forward many years, and girls sports evolved into something meaningful. 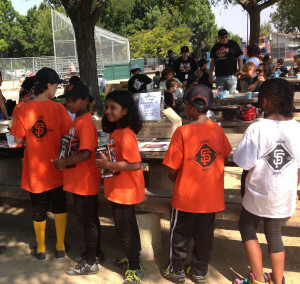 Junior Giants became a model program for boys AND girls who wanted to play, but didn’t have other options. The program sounded intriguing and worthwhile, and a great way to involve girls in the game. A little jealous that I’d missed the boat as a player, I donated my car and started attending the Play Ball Lunch sponsored by the Giants Community Fund. I was impressed. Then I heard that our Police Activities League was starting a Junior Giants program. I jumped in, told them they really needed my help, and became the League Coordinator. I’d been working with local families through my job, so it was a perfect match. Now, there’s nothing else I’d rather be doing. I volunteer at least 25 hours a week during the season, and provide other support throughout the year. During our first 3 years, I’ve watched kids growing towards adulthood. They get involved in their community, they provide inspiration to their families and neighbors, and they have lots of fun. We have incredible volunteers who coach, coordinate and make the program successful. Every week, players, coaches and parents discuss a Word of the Week (WOW) that illustrates basic character qualities. I talk to the kids about these, giving out prizes for their responses. It’s fun to hear a 5 or 6 year old explain integrity. But even better to see the principles in action. Story #2: I asked an 8 year old during Health Week if he was eating any new fruits or vegetables that summer. “Well,” he said, “I’m eating mango, cauliflower and broccoli.” “Hmmm, cauliflower and broccoli?” I asked, impressed by his choices. “Well, not so much the cauliflower” was his honest response. But at least I know his family was eating those healthy foods too, influenced by the Junior Giants. Story #3: Kyle, 10 years old, practices his skills with his father in front of his apartment. Because of his confidence and encouragement, 2 neighbor girls joined the league this year. He inspired them to be a part of the program. I have more stories (just ask!) than these 3 examples of the growth of our players and the involvement of families in Junior Giants principles. This year, our league (Sunnyvale) is the face of Junior Giants, so look for our kids on posters, bobblehead boxes, and other promotions. It’s a great program that I’m honored and thrilled to be a part of. And you can help! This Saturday is the Junior Giants Glove Drive! If you’re going to the game, bring a glove or $10 to donate, and you’ll get a special Brandon Crawford pin. Or donate online. Contribute to the next generation of people with character who love baseball as much as you do!